How Did The Universe Survive This Paradox? 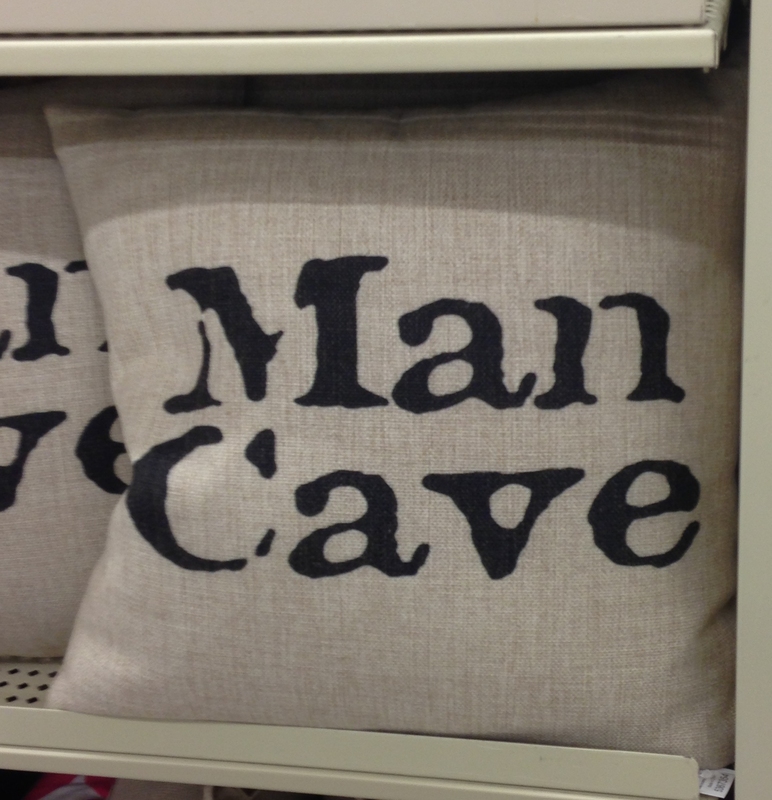 It’s a decorative throw pillow. I’m not sure how the manufacture of this eldritch artifact did not immediately consume the entirety of the universe in some sort of instantaneous energy inversion triggered by the paradox. UPDATE: Thanks for the link, Ms. K. Hey, VftP readers, check out my IT-themed comic heist novel John Donnelly’s Gold and my (allegedly) humorous play The Courtship of Barbara Holt, both available on Kindle for .99 or in paperback. St. Charles-area book lovers can celebrate: Main Street Books, expected to close this month, has found new owners. Current owners [Redacted] said today that Emily, [Redacted] will buy the store as of Feb. 14. [Redacted], 24, a graduate of Truman State University who majored in English, will oversee the day-to-day operations of Main Street Books. Her parents live in Weldon Spring and she lives in Bel-Nor. I’m pleased to see the book store survive because I like independent book stores, and my beautiful wife and I visited this shop on our first date. I’m a little reserved about it, though, given that it’s being bought to provide a job for a young English major. Hopefully, she’ll handle it. Please plan to laugh politely when I come up with the appropriate setup. This book was a part of my beautiful wife’s collection until she decided to winnow her collection down. I culled the discards for books I wanted, and so I got this one. Which I might have gotten for her as a gift in the swirling clouds of the past. 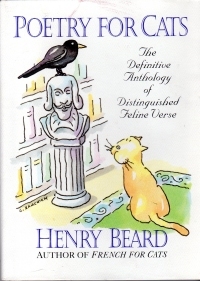 This book is a collection of poems as written by famous poets’ cats. You’ve got “The Cat’s Tale” by Chaucer’s cat, “Vet, Be Not Proud” by John Donne’s cat, “Kubla Kat” by Samuel Taylor Coleridge’s cat, and so on. They’re very clever, and I felt very clever and/or well-read for recognizing most of the source material. It only cost me $40,000 plus interest in an English degree for that. But, as with my riff about the loss of allusion in heavy metal music, I have to wonder if there are many Generation X-level people who would enjoy this book or if there are any members of later generations that would get them at all. Some, I suppose, but not many. Ah, life. There is no before-me, there is no after-me, there is only during-me. At any rate, as I said, I enjoyed the brief little book, and the book made me want to re-read the poems they were based on. Did you know I used to be able to recite “The Love Song of J. Alfred Prufrock” from memory? Indeed, I used to do it at poetry open-mic nights in St. Louis, and I impressed my beautiful wife (then my beautiful girlfriend)’s mother, an English teacher in high school, by reciting it to her the first time we met. But that’s been a long time. I should work on re-memorizing those things. This book was designed as a gift for graduating seniors. It’s got a little place for a to and from in the beginning and a message. Given that 1995 was about seventeen years from 1978 (and ninteen years from now, old man), I’m deducing here. 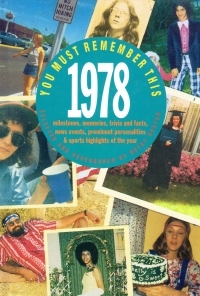 It’s a little book of tidbits, a couple lists about news stories and pop culture in the year 1978. I was six in 1978, so I don’t remember any of the news from that time. I mean, I do know of the things now: the Camp David Accords, Jim Jones, Sid and Nancy, and so on, but I don’t remember knowing them at the time. The first news things I think I can recollect are gas lines, the Iranian Hostage Crisis, and the assassination attempt on Ronald Reagan. The only pop-cultural things I knew then were the television programs: Laverne and Shirley number 1, Happy Days number 2. But I know of the music (“Night Fever” the number one record, higher than “Stayin’ Alive”. Really?) and the books (#1: If Life is a Bowl of Cherries, What Am I Doing In The Pits?) because the cultural impact is more resonant over the years than the news items themselves. Still, it’s a good reprise to bring you back a bit and maybe freshen things up if the Jeopardy! people summon me for an audition this year. And, strangely enough, it’s probably a quicker read than this blog post was. Ah, now this book is a little more manly that decoupagistry. This book is the first of a three-volume set that includes all of the Conan stories in the original order, which is to say not chronological order according to Conan’s point of view. Howard wrote just a bunch of stories from Conan’s life with a handy history guide he created after a couple of the stories. 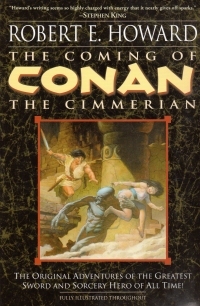 For those of you who don’t know, the Conan stories are set in a prehistoric age called the Hyborean Age wedged between the fall of Atlantis and the rise of our recorded civilizations. They’re centered around a land mass similar to Europe, but different enough. Conan is a king fighting assassins, a pirate, a mercenary, and a bunch of different things as he swashbuckles through a series of adventures that are fresh enough in the beginning, but at the end of the volume start to become just a touch formulaic. As they would, being the inspiration for many knock-offs we’ve all seen in film since then and have read other stories (Brak the Destroyer, I’m looking at you–John Jakes endorses the Conan stories with a quote on the cover, and he’s identified as the author of North and South, but I remember him most as a writer of a couple of collected volumes of stories similar to this). It’s definitely sword and sorcery, as the gods, demons, and summoning make up many parts of plot points. Some of the descriptions are even Lovecraftian–and it comes as no surprise, as Howard and Lovecraft corresponded and worked for the same editors and magazines. Conan stories are a bit like Lovecraft stories where humanity gets to hit back. In addition to the stories, there are a couple of introductory and academic essays explaining the Importance of Howard and a bit of his writing chronology. They’re okay if you don’t take them too seriously and don’t mind skipping past it. I don’t know why I want my actual histories to be written by homers who appreciate and somewhat applaud or respect their subject, but I get a little irritated when editors and literature majors do that with fiction. The book also includes the aforementioned history of the Hyborean age that Howard wrote to keep his notes and stories straight, some maps in his hand, and some fragments and drafts. It also includes his first draft of his first Conan story. When you compare them directly, you get a pretty good sense of how editting can improve writing. I’m a poor editor, as readers of my books can attest, but this example offers a stark example of the benefits. So I enjoyed the book, but given its length and the fact that it is short stories means it took me longer than I would have liked to have read it. So although I own the other volumes, I don’t expect to dive right into them immediately. But I look forward to them. 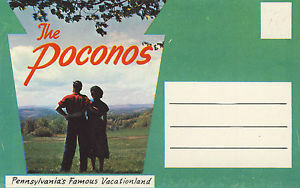 He might just have the most enviable collection of Poconos cards in his class. As you might know, gentle reader, my beautiful wife and I are pretentious enough that our cats have literary or mythological names. Retired names include Galt, Ajax, and Dominique. Our current group of prowlers include Tristan, Aurora, Roark, Athena, and Isis. But I hereby announce my intent that we name our next cats in the following literary fashion: H.P. Lovecraft stories. I’ll have to stop there, or I’ll republish the whole bibliography in a different order. I’m so inspired that I want to go to the feline recycling center right now. An 80-year-old man was struck and killed this morning near Hillsboro and authorities are searching for the pickup believed to have struck him before driving away. So guns aren’t the only self-activating agents of human destruction any more. On the one hand, it’s not passive voice, which is poor writing. On the other hand, ascribing actions to objects is worse than obscuring agency through passive voice. This book is the first book I’ve read this year, and it’s the end of January. My weeks and nights have been fairly busy through this part of the year, friends, and I’m suddenly afraid that I will never again hit the hundred-books-a-year pace I sometimes feebly use to rationalize my hundred-books-a-weekend book buying sprees. And I got this book from the library, no less, something to flip through during football games. I wasn’t even that good about flipping through books during games this year, and there are no more games, alas. Where was I? 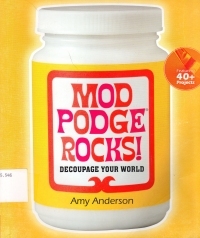 Oh, yes, Modge Podge Rocks. It’s basically a book about decoupage, which is gluing and shellacking paper or similar material to other material. Modge Podge is a popular compound for doing this. You brush some on the surface to which you want to adhere the decorations, press on the decorations, and layer more Modge Podge over the top. There’s not a lot to it, and you can have some interesting effects on stuff. This book started out as a blog where the author did some decoupage and posted it, and later other people submitted things. And the author got a book deal. Strangely, one of the guest designers is Cathie Fillian, whose television program Creative Juice served as the inspiration for my forays into crafting. So I’ve done some decoupaging before based on the inspiration from Creative Juice, I’ve gotten away from it and the whole crafting thing because my ideas have outpaced my skill level with these things, which leads to reluctance to start something new. So this book has reminded me about this particular crafting style and could serve as a good introduction to those who aren’t familiar with the craft. General Motors is recalling 370,000 Chevrolet Silverado and GMC Sierra pickups from the 2014 model year to fix software that could cause the exhaust components to overheat and start a fire. GM said eight fires have been reported, but no injuries. The company is asking customers not to leave their trucks idling unattended. You know, the best place to be when your automaker’s software is going the full Edgar on you is inside the vehicle, where software-controlled door locks and electronic windows won’t hamper your escape at all. Sure, it’s just Romeo and Juliet, but Ratt knew who they were. Or at the very least retold the stories found in the works of respected elder horror writers. You know, as though the songwriters had read a book or something. I’ve sampled some recent hard rock and heavy metal, and I don’t see a similar literary bent to it. What am I missing? Or has it in fact dumbed down with the rest of our culture now that the classics aren’t even nodded at in contemporary education? There’s a little black cat with white paws that lives down in the little wooded gully at the front of our property. He comes around the house sometimes, but shies away from us if he sees us. I’m glad to see he’s made it through the recent polar vortex. I just wish he wouldn’t do that. It annoys our cats and prompts them to mark their side of the door from time to time. Back in 2010, I did a little throwaway bit about a courier company that helped an elderly woman avoid being taken in by a scam. The story itself was on StLToday.com, and it mostly focused on the Arizona company trying to bilk the old woman out of $15,000. Me, I just wondered how the courier knew what he was delivering. And so I made that little post, playing in my head to the paranoia schtick I toss around on here from time to time (I don’t actually eat my shredded documents, you know) and a bit of the-newspaper-is-leaving-some-of-the-story-out bit. The owner of the courier company contacted me to explain the rest of the story, and I’ve appended it to the original post. The part of the story the St. Louis Post-Dispatch blogger didn’t cover is as interesting as what he did. Who else could read the first sentence of a story entitled I Embedded with a Community of Meth Users and think of home? 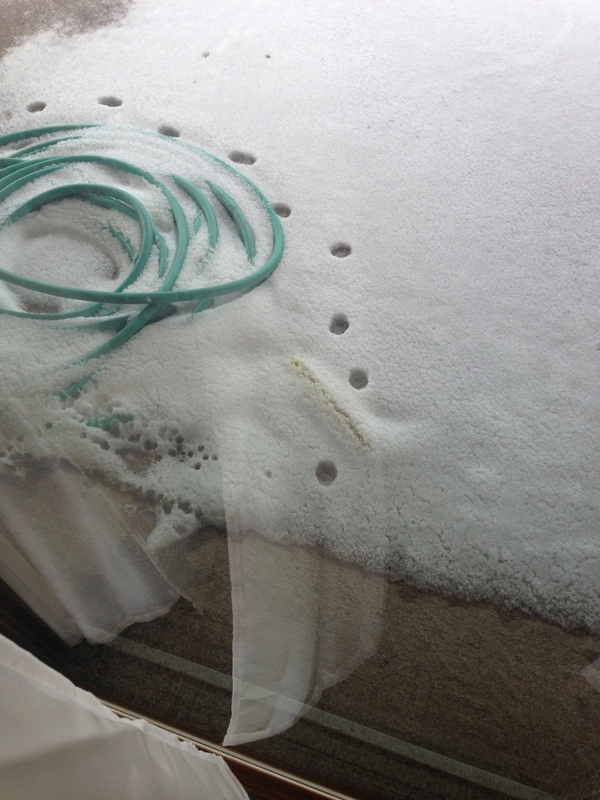 The trailer parks of Jefferson County, Missouri, are a far cry from the international cartels of Breaking Bad, but this is the real picture of meth in America…. I lived in just such a place. 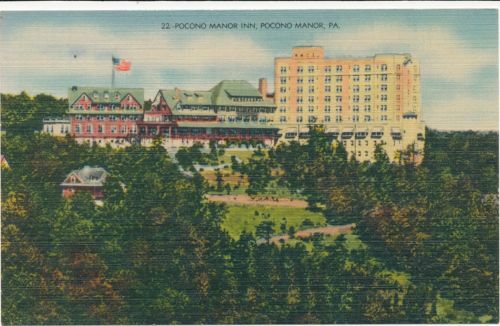 Although the mobile home I lived in at this location was not quite so nice. As a matter of fact, it was the most ramshackle one in Siesta Mobil Home Park and it undoubtedly melted in the rain sometime between then and now. The empty pad to the northwest, there, is where the Hittler trailer was. I still have the table they left behind when they moved their trailer. The tree on the little hill in the back there? My brother tore his finger up falling out of it one day right before we moved, and my mother made him wait with a compress before taking him to the ER because she was showing the trailer to someone interested in buying it. He followed her (and my father’s) footsteps into the Marine Corps, so perhaps she was toughening him up for it. At any rate, I left the trailer park for the house in the valley down the dirt road in 1987 or 1988, and I left that house for good before the meth problem really took off. Kinda like I left the projects before the crack epidemic hit. Why, it’s almost like people don’t take my leaving very well. After the somewhat saddening striking of the Christmas decorations, we have the annual hunt for the Christmas straggler, the decoration missed when decamping them. I know! You’re saying, Brian J., do you decorate your empty gumball machine every year? Truth of the matter is that I do not. That particular decoration started on the tree until the new young black cat harvested it. After that, I hung it on a nail over the stairs that had remained without adornment in the four years we’ve been in Nogglestead. I received a Green Bay Packers wall hanging for Christmas, so I swapped it for the wreath on Christmas day and put the wreath on the desk downstairs so I’d remember to pack it up when we packed the decorations, and then…. A child hung the ornament on the gumball machine. 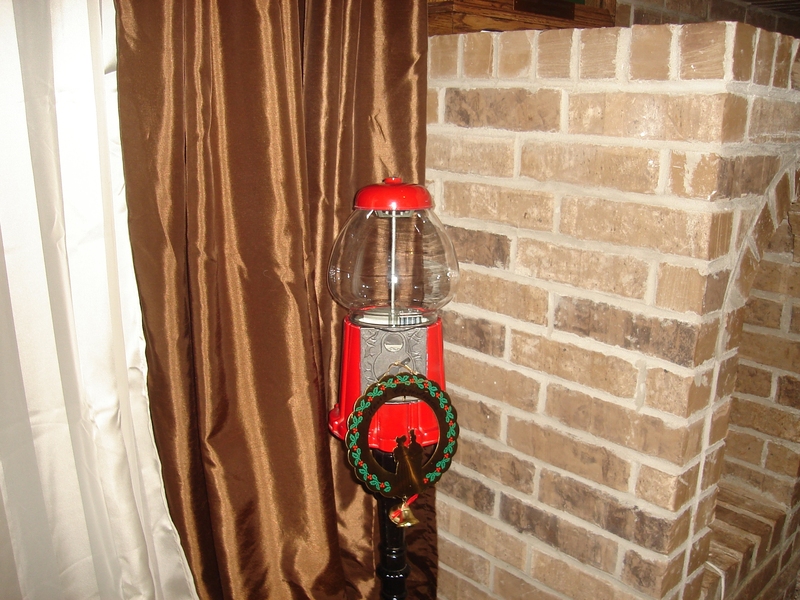 As I did not decorate the gumball machine, I did not think to look on the gumball machine for decorations. But it could not remain subtly hidden for eleven months. Oh, no, this misplaced wreath had to announce its presence the day after the Christmas decorations were safely ensconced deeply in the short closet beneath the stairs, safely defended by the in-home vacuum hose hydra and bicycle trainer. To taunt me with how much work I’d have to undo and redo in putting it into the bin with the other ornamentation. Needless to say, I have not yet undertaken that step. Instead, I’ve blogged about it. And by the time I get around to actually putting it away, eleven months might elapse. City officials and civic leaders have begun talking with private donors and area museum leaders about taking over the maintenance, financing — and perhaps operations — of the city-owned Soldiers Memorial Military Museum downtown, including its archives of war letters, weapons, uniforms, medals and other artifacts. The museum’s collection has been neglected for years, leading some city officials to call it embarrassing. The building needs more than $6 million in upgrades and repairs, according to city files. And the city has tried multiple times, always unsuccessfully, to find it another caretaker. The annual budget is apparently $150,000 including two staffers. Compare and contrast this, gentle reader, in your mind with the money that the city regularly throws away in tax incentives to land developers, to sports teams for new ballparks, and even to film makers who might spend a day or two in town with rolling cameras not to mention the one-offs for feasibility studies for current fads and harebrained schemes. Which are cool things. Remembering history and the sacrifices that unimaginable others made and would make for the American way of life? That’s hard, man. 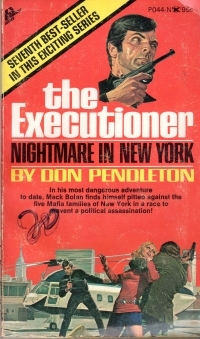 This book is The Executioner in New York, blowing things up and shooting Mafia. The title says New York, but it could be anywhere, of course. The sense of place is pretty much limited to the title. You get more sense of place and time from Nightmare in Manhattan, for crying out loud. And it’s a series of set pieces much like the rest of the books. Sorry, I read it hard on the heels of Hard Magic, so it suffers by comparison. A lot. So now I look at the shelves full of Bolan titles with a little trepidation.